Action causes reaction. This principle also applies in the design world, where one of the trends today – slow tech – is challenging the digitization age with a variety of authentic, high-quality designs. The Arne Jacobsen weather station is based on the world famous Bankers Clock, consisting of a wall clock, thermometer, barometer and hygrometer. Grouped together, they bring the weather station back to contemporary interiors, while each piece also can be purchased and used separately. 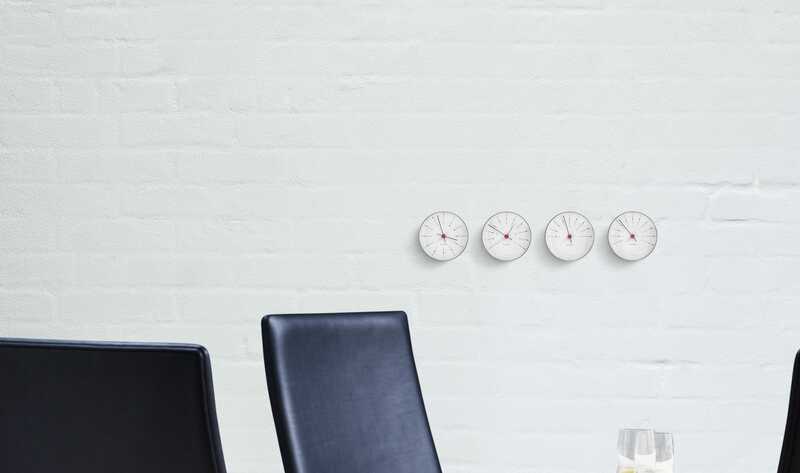 Arne Jacobsen's weather station is designed with inspiration in the wall clock Bankers, which Jacobsen created for Denmarks Nationalbank in 1971. The design is typically Arne Jacobsen with a focus on the simple and beautiful expression. The weather station consists of wall clock, barometer, hygrometer and thermometer. In addition to decorating your home, a weather station from Arne Jacobsen creates calm over your home and radiates style, awareness and sense of design. Give your home a Scandinavian edge and adorn an empty wall with a weather station designed by Arne Jacobsen. The minimalist design harmonizes in many homes and signals that you have control over your Danish design. Arne Jacobsen's Bankers weather stations are a great place to start for those who want to decorate with a Scandinavian eye for detail and design. But a weather station has many other functions and can be an exciting and helpful instrument in everyday life. Arne Jacobsen Banker's weather stations are available in four parts. You can choose to buy one, more or all four. All measures Ø12 cm. The barometer - the barometer gives an overview of the air pressure and can with great precision predict whether the weather becomes stormy or calm. The Hygrometer - a hydrometer can indicate the humidity so people with lung problems can take their reservations. The wall clock - shows time in its own unique way.